Demographic variables such as fertility, mortality, migration and family structures notably respond to economic incentives and in turn affect the economic development of societies. 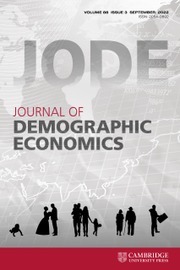 Journal of Demographic Economics welcomes both empirical and theoretical papers on issues relevant to Demographic Economics with a preference for combining abstract economic or demographic models together with data to highlight major mechanisms. The journal was first published in 1929 as Bulletin de l’Institut des Sciences Economiques. It later became known as Louvain Economic Review, and continued till 2014 to publish under this title. In 2015, it moved to Cambridge University Press, increased its international character and changed its focus exclusively to demographic economics. WHY ARE MARRIED WOMEN WORKING SO MUCH?